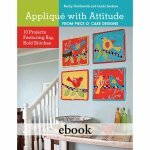 Does your applique need a little attitude adjustment? We are coming to your rescue with these creative new projects! This is fast needleturn applique with bold stitches in contrasting colors of perle cotton thread. No tiny invisible stitches... instead the applique is held to the block with bold, beautiful stitches. You are going to love it! 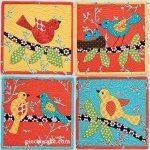 You'll love making these chirpy birds, doodly daisies, and sweet tulips with your favorite fresh fabrics. The bold stitches made with perle cotton add a happy, carefree layer of color and texture to your work. 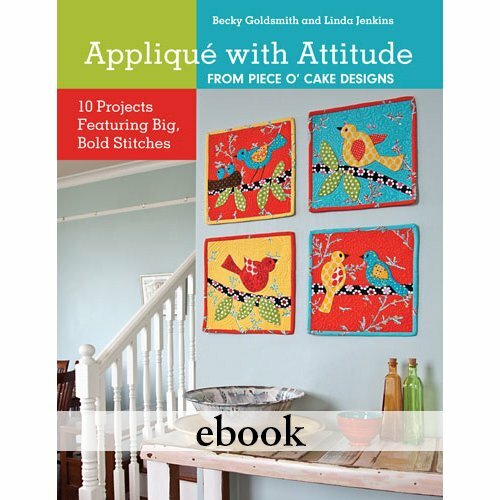 Click here to see pictures of the quilts that are in this eBook. You'll find that using this quick needleturn technique will add a touch of whimsy to anything you appliquÃ©. Mix and match the full-size designs for bright, cheerful quilts and home decor. These fast, cute projects make wonderful gifts and/or baby quilts!